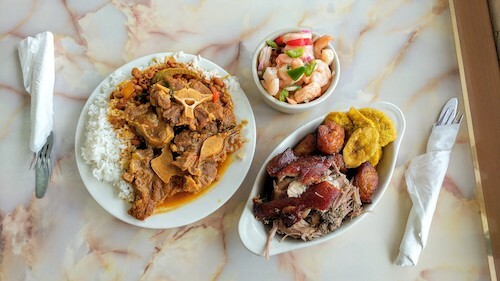 Dominican restaurants are not hard to find in New York City, as one of our largest and multi-generational communities have roots from the island. But feeling like you are on the Greater Antilles isle of Hispaniola is not easy to recreate, as city life makes this almost impossible. Brisas del Mar comes close, a couple blocks away from the beaches of the Rockaways, full of shirtless beach kids and laid back neighborhood folks. It also attracts a pan-Latinx crowd, with Mexican and Central American construction crews working nearby all finding their way here for lunch. 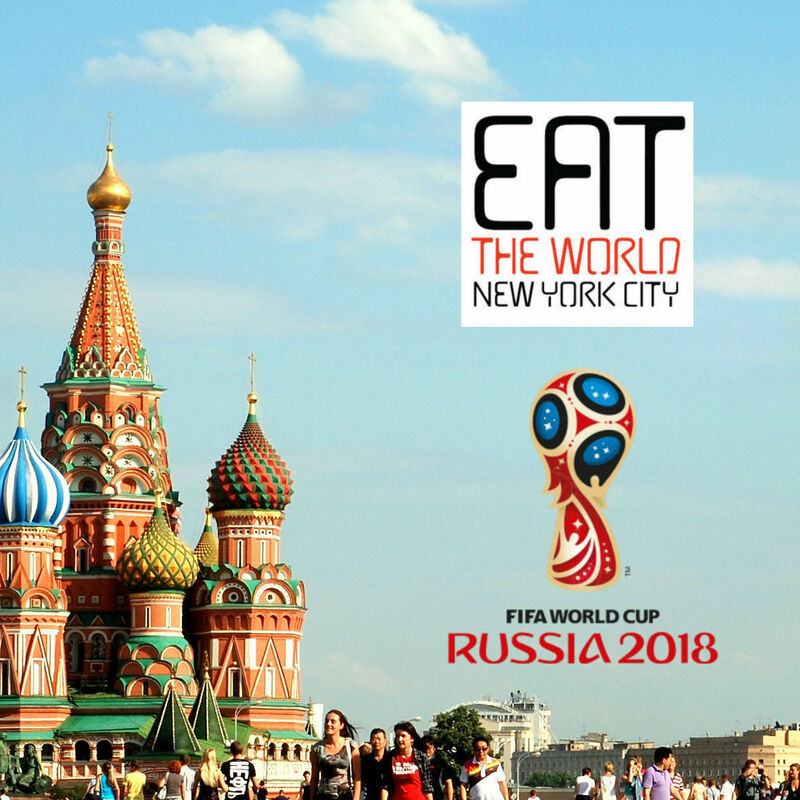 It seems that everyone in the know is eating here, while those that come in for a beach day and read garbage online publications are cordoned off somewhere else. It's busy enough though, no need for their coddled toddlers and manicured beards. The tables have a feel of meeting rooms, as if the spot is a big community hub. Most people are eating, but they might also come for a coffee and chat. On the Monday afternoon of our visit, the spot was buzzing for lunch. Along the right wall the selections of the day are laid out for all to see. A range of stewed or roasted meats, fish, and shrimp as well as all the necessary sides to accompany everything. Take note of the people who came in before you, and work your way towards the front once you have an idea of what you want. Customers are expected to sort their own order out, so stay firm when it is your turn so as not to get passed by another hungry soul. You could ask the pricing structure as you go, but it is all very fair and the people working will add it up at the end. Our feast pictured above all came to $25 and even included the two drinks we grabbed from the fridge. The beautiful reddish-brown broth of the oxtail stew (below) immediately grabbed our attention and was the first order. An order with rice and beans comes with a mountain of white rice that we asked to be reduced knowing there would be at least a couple more plates coming our way. 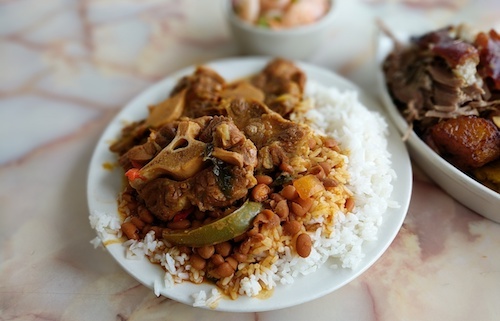 The oxtail meat seems almost unimprovable, tender and flavorful hunks that come easily of the bone. An extra spoon or two of the gravy never hurts either. 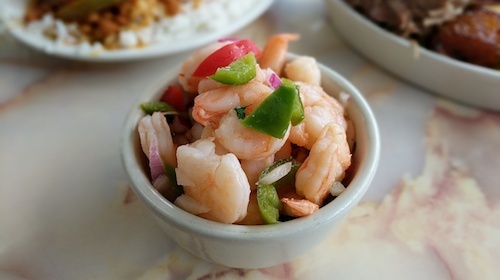 The shrimp salad (below) was crisp and fresh, mostly unseasoned other than a bit of lime juice. We snuck a couple bites of this during our meal but packed most of it in our cooler for a beach snack later. 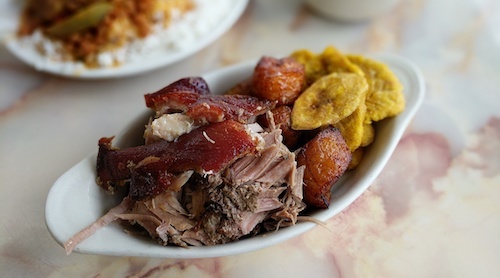 The roast pork (below) is very memorable, also not overly seasoned and allowing the meat to speak for itself. As always in this preparation, the skin is crisped with care and a thin layer of fat holds onto it, creating the most sought after bites. Orders of both types of plantains (below) were enjoyed, but the fried sweet version wins top prize. If you plan on ordering a lot, mention you want small portions of each dish or you will receive mountains upon mountains. Each portion can be added or subtracted to, and as mentioned already, it all seems very fair. There seems to be no better way to begin or end a day in the Rockaways. When the winds kick off the sea and bring the salty air to your nose, it comes as close as possible to eating on the malecon in Santo Domingo.